Whether you are building an elegant mall kiosk, a custom display case or a complete interior build-out, Northcoast Woodsmiths can help you make an impressive display. We specialize in interior build-outs and kiosk manufacturing as well as custom business casework and fixtures. What makes us unique is the extra service we extend beyond the production stage. At Northcoast Woodsmiths, we can provide step-by-step assistance through all aspects of a retail display project as your contract coordinator. From design conception to blueprints, manufacturing, delivery, trade scheduling and set-up…Northcoast is experienced, dedicated and ready to help. When Northcoast Woodsmiths first opened its shop doors in 1982, we manufactured custom casework for interior decorators and general contractors. As our business grew, we realized that our customers also had a growing need for project coordination. With a solid background in build-outs and kiosk manufacturing, Northcoast is well equipped to help you with the numerous exacting details inherent in specialized retail construction projects. So in addition to manufacturing well-designed, functional displays, Northcoast Woodsmiths also offers such services as mediating with mall tenant coordinators and contracting any necessary outside trades. In addition, there is a wide spectrum of codes and criteria in each city, county and state that apply to every shopping mall. Northcoast lets you know as far ahead as possible if your project is feasible and acceptable to mall and local authorities. We can then help you develop blueprints to meet building permit requirements and obtain mall approval. These prints become our shop drawings, helping us to produce a superior product with unlimited display opportunities. Blending function and style, we deliver…satisfaction. Northcoast Woodsmiths has years of successful experience with retailers displaying candies, jewelry, perfume, clothing, watches, magazines, food and many other specialty items. As a contract coordinator, we meet with mall planners to understand their design criteria, then we help mall tenants meet those requirements. This insures one uniform, classic look that blends smoothly into an existing mall design. Still, there is room for diversity. Do you need a special type of cabinet? Need refrigeration or plumbing? Northcoast Woodsmiths realizes there is more to an effective display than just meeting guidelines. We work with your needs and your budget to construct a kiosk, interior build-out or showcase that is functional and versatile while offering the maximum merchandising impact. When we say Northcoast Woodsmiths delivers, we mean more than delivering to forty-eight states and parts of Canada. We mean that we guarantee high quality workmanship and dedicated, personalized service. Once your design is finalized, Northcoast Woodsmiths uses the most durable, attractive, cost-effective materials to manufacture your product. We also save you money because we handcraft most of the display components and fixtures directly in our shop…that means you get almost everything at wholesale prices! And we fabricate and assemble as much as possible ahead of time, greatly reducing costly time at the set-up site. After the in-shop production is complete, Northcoast schedules delivery with all the parties involved. We can contract any other trades needed, from carpentry to plumbing and electrical work. Your retail display can then be installed within an optimal timeframe (sometimes within a few hours for an entire kiosk!). Customers count on us for a variety of reasons. New customers rely on our experience; we understand the regulations, the limitations, and the possibilities. Chain store customers enjoy having one contractor handle all of their needs. And mall owners prefer one company to produce a uniform retail design that meets all their kiosk, interior build-out and display criteria. Whatever the reason for each customer, our utmost priority is to satisfy every one. 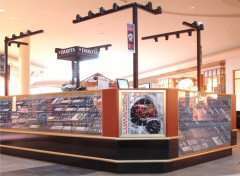 Northcoast Woodsmiths is ready to handle your entire retail display production or a single step. Our goal is to display your product in the most appealing, most economical, most effective way possible. That’s how we display our real talents!